Local Attractions: The coast is roughly a 25 minute drive from the apartment. The pretty tourist village of Mijas is 10 km away and also contains a superb public outdoor pool. The cultural cities of Ronda, Granada and Antequera are within easy reach by car. There are golf courses (Lauro Golf and Alhaurin Golf) at either end of the town. Mijas Golf is 20 minutes away by car. The area is very popular with walkers as there are a number of National Parks within a short drive. The lakes at Ardales Park are well worth a visit as is the Chorro Gorge and the Limestone ridge at Torcal. In keeping with all Andalusian towns there are many festivals and fiestas (highlights being the annual town festival 'feria' at the end of May and the Easter week 'Semana Santa'). There are jazz and flamenco festivals on during the month of June.The town boasts over 20 restaurants many of them serving fresh fish and shellfish from nearby Malaga (our personal favourite is restaurant Sardina, a fifteen minute walk from the flat.). We bought our apartment back in 2002. I have a cousin who has lived most of her life in Spain and since visiting her twenty years ago in Madrid, my wife and I have fallen in love with the country and its people. Forget the stereotypes about the Costas, Spain is a huge and very diverse melting pot of scenery, food, culture and great people. Visit the great Andalucian classic cities and head inland for some stunning scenery,great value and an unforgettable time! Alhaurin has avoided the commercialism of the costas and retains a lovely Spanish atmosphere. The town is roughly equidistant between the three Spanish classic cities of Granada, Cordoba and Seville which all have fabulous personality history and charm. The town boasts good restaurants, tennis courts , swimming pools and plenty of shops. You are never stuck for things to do. In the evening it is nice to kick back and look at the unadulterated views out over the orange grove to the Sierra beyond. We have planted jasmine on the lower of the two terraces and the scent is wonderful! We have a wall mounted Samsung air conditioning unit in the lounge and another one in the master bedroom. We have two lovely terraces , the larger one at ground level is covered by vines to protect you from the sun, the smaller sun terrace is up a flight of stairs and has the 4 sun loungers on it. Two terraces, one of which is shaded by vines, the other is exposed to the sun. Both have beautiful views overlooking an Orange Grove. A small barbecue grill is provided. The apartment is able to receive both the 'Amena' and 'Orange' and 'Movistar' mobile telephone signals amongst others.The nearest internet cafe is only 800 metres away. Parking immediately outside the apartment is always possible as we are on a quiet residential street. We were really impressed with how roomy the flat was & the quality of the kitchen and bathrooms. It was also handy for town, with its excellent choice of restaurants. Just to say what another wonderful break we girls had at the end of May 2016. The apartment was comfortable and ideally suited for exploring the village and surrounding area. We took your advice and tried the new tapas bar....absolutely wonderful food! And the Gin tonic was rather good too! 😊...We enjoyed going to some of our favourites from last year too. The lovely Juan picked us up and laid as down as and when required and was a good source of information. We had a great time at the festival with all the dancing and music in the street, great tapas and margaritas..the funfair and fireworks display on the last night was amazing and we had a great view from the top terrace of your apartment. As always it was a joy to visit and we would love to go back. Thanks again Pete and Karen. 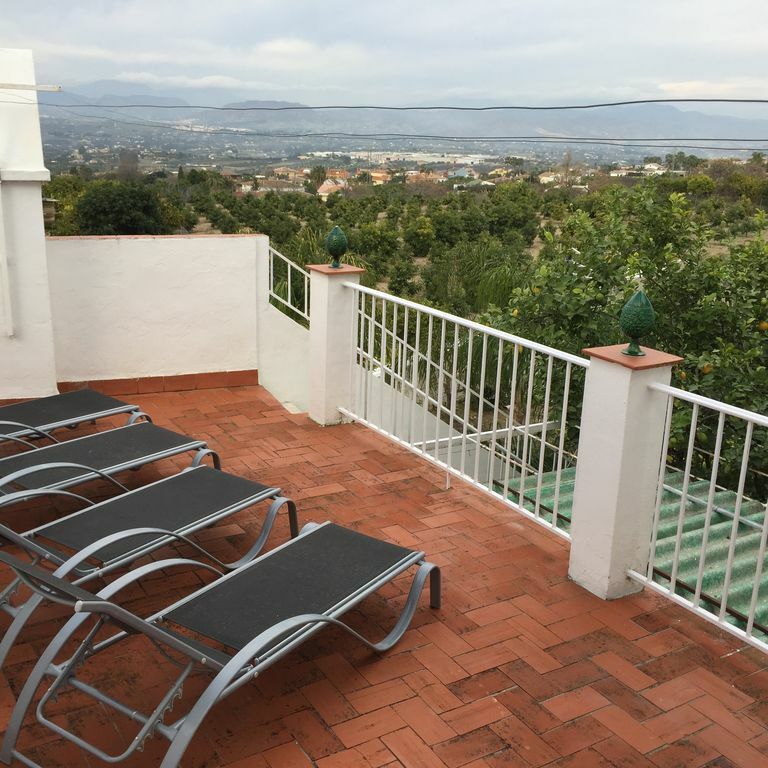 We used the “Orange Grove View” as a base for a 4 man golfing holiday in June. The apartment had everything we needed for the perfect getaway. •	Excellent rural location in Alhaurin el Grande away from the main tourist areas at the coast. •	Spacious public rooms and terraces with views on which pre-dinner drinks were enjoyed. •	Close proximity to some fantastic restaurants which offered exceptional quality and value as well as a warm welcome and friendly service. We visited the restaurants recommended by Peter and were not disappointed. •	Close proximity to the Alhaurin Golf Club which provides a spectacular setting and thoroughly deserves its “must play” status. •	We used Juan, a local taxi driver recommended by Peter. Juan was reliable and prompt (by Spanish standards) and provided an excellent friendly service as well as up to date advice on any bars and restaurants that should be avoided! •	The apartment provided a haven of tranquillity; situated in a side street away from the main road and free from spouses. •	The only downside was that there was no sports psychologist on hand to deal with the issues that 3 members of the party encountered during each day’s play. An excellent break, thoroughly enjoyed by all and thanks to Peter for all the recommendations. Just wanted to thank you both for introducing us to your secret Spain! What a wonderful time we had!! Very nice property with sufficient space for 6 adults and a child. The restaurants recommended by the owner were within walking distance and excellent. Wifi would have been nice but not necessary. We had a car and parking was not a problem. Thank you! We are glad you enjoyed your stay (and the many good local restaurants) We feel that proximity to the restaurants is a big plus as it only entails a short walk, not taking the car. Ski: Sol y nieve is the local ski resort, towering above Granada, it is a 2 and a half hour drive from the apartment. We have used it on several occasions. On a clear day it is possible to see Africa from the top. It is also one of the few resorts in the world where you truly can ski in the morning and drive down to the coast and swim in the afternoon! Watch the restaurants at the resort prepare giant outdoor paellas on good days! We take a fully refundable damage deposit of £50 to cover any breakages or damages. This is fully refundable, assuming no damages. We have signed up for Homeaway`s secure electronic payment system and we can refund the damage deposit by the same electronic method. As an alternative we have a "Paypal" account or we can give you our international bank account number for a secure B.A.C.S. transfer.